It seems I've been working on a transportation theme in my decorations to my "Oh The Places You'll Go" Graduation Party. 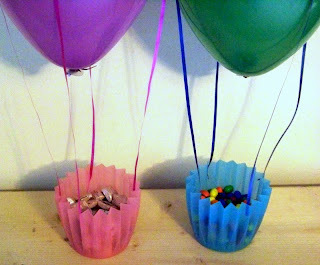 So it seemed the perfect time to try my idea for Hot Air Balloon Candy Dishes. I think they turned out pretty cool and the pictures don't really do them justice. I found these "buckets" at Big Lots in the spring section. They had several different colors and were only $1.00 each. I bought pink and blue figuring that way I could use them again in Spring parties since they kind of looked flowery to me or even for baby showers. I wrapped the ribbon around the middle of a regular helium filled balloon to measure size. The ribbon ended up measuring 33 inches. I then cut 4 strands of 20 inches each of curling ribbon in a coordinating color. I wanted my ribbon strings to be even around the balloon, so I glued them to my balloon ribbon 8 inches apart. Then I glued the balloon ribbon around the balloon in the middle. Make sure it's pretty tight if you do this otherwise the balloon will slip through the top. I then glued the ribbon evenly around the candy bowl basket by gluing opposite sides of ribbon to opposite sides of the basket. At this point I found that some of my ribbons needed a little readjustment so the balloon floated evenly above the basket. If you hot glued the ribbon to the basket, it is pretty easy to just pull the ribbon off the basket and re-adjust. When I was happy with them, I filled with M&Ms and Hershey Bliss candies for the party! Cool idea for candy dishes. Oh, the comments you would get at parties with these....oooohhhs and aaahhhhs for sure.